Above was clipped from one of Dunham’s Weekly circulars, the “Sports Hunting Circular” with prices valid through 10/13/2012. For those not in the know, Dunham’s is the place to go for long underwear in a camo print, soccer jerseys for the kids, hockey sticks and skates, socks, athletic supporters, duck calls, etc. It’s like a discount Cabelas that also serves as a one-stop-shop for people with kids playing school sports. The item in question is a civilian model of the HK 416, supposedly one of the best automatic rifles in the world. I’m normally not that excited about civilian semi-auto carbines, but $549.99 seemed too good a deal to pass up. Come zombie apocalypse or the rise of the machines, I’d want something with the combined accuracy and ROF of a semi-auto carbine, and the HK416 is not only better than the various AR15 clones in terms of fewer ‘failure to feed’ problems, but is also the weapon of choice for special forces around the world — and, at $549.99, cheaper as well. If my future involved manning the barricades, I wanted an HK416 in my hands. It’s the rifle that killed Bin Laden. Well, I visited two Dunham’s and called several more, and not only did they not have it, everyone I spoke to said they never carry any rifles from Heckler Koch but they would gladly sell me a Bushmaster carbine for $999.99 if I used the coupon, $1099.99 regular price. Bunch of bait and switch motherfuckers. 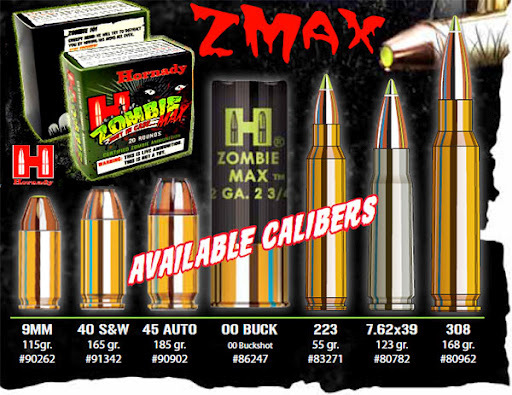 Tip of the hat for marketing genius goes to whomever came up with Hornady “Zombie-Max” ammo. Yes, it is for real. Hornady is one of the many companies selling ammunition in the US and came up with “Zombie-Max” to sell more ammo to more people. The ammo is apparently a capped hollowpoint, but the plastic cap is green instead of the usual white or clear, which of course means it is better for killing zombies, because zombies are (apparently) sensitive to green plastic the way that werewolves are sensitive to silver. Who knew? If green plastic does kill zombies, I’m going to buy a bunch of green plastic army men, grind ’em up and pack ’em into shotgun shells. Just in case. That rifle + that ammo is a sure fire way to eliminate zombie Bib Laden, should he rise for the watery depths.